Awards: Top 10 winners will be announced. Trophies for 1st – 5th places. Cook teams may cook on gas grills, charcoal grills, electric grills, or wood grills. More than one team may use the same fire source. However, each team must use different burger recipes. Burger patty can be made of any protein or meat you choose. Burger meat must be ground and be shaped into the form of a patty. The competition will provide each team one turn-in box. Turn in one whole full size burger in the provided box. The provided foil sheet must stay under the burger. The burger should not be cut into pieces. Burgers may not be branded in any way. No inedible garnish is allowed, with the exception of small disposable cups containing sauces/dips and toothpicks/skewers holding burger items together. No decorations in the box. Burgers will be judged on taste, originality, and appearance. In case of a tie, taste will be the first tie breaker, followed by originality. 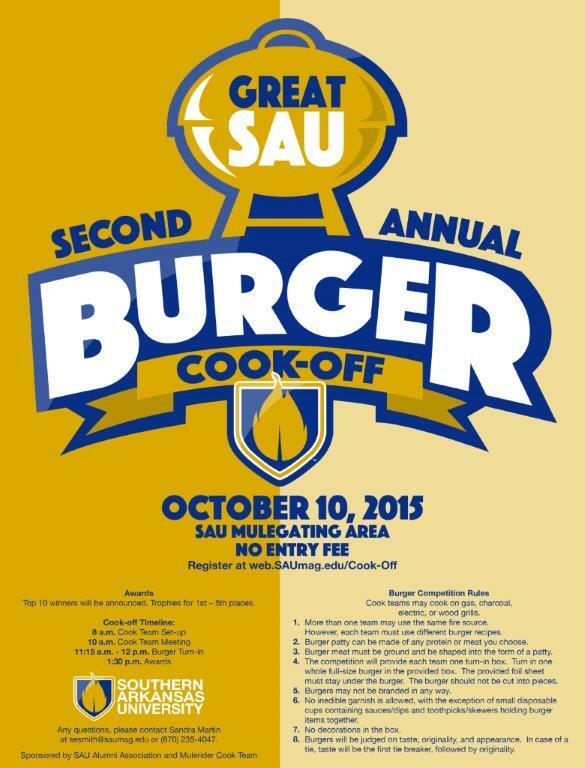 Any questions, please contact Sandra Martin at sesmith@saumag.edu or (870)235-4047.